A project is a multistep activity undertaken by an individual or group to achieve a particular aim. With that broad definition there’s a lot of project-based learning happening in schools these days. Some is better than others and there are a lot of variations: some thin, some deep; some teacher-led, some student-driven; some with clear deliverables, and some very open-ended. In an effort to help educators select a strategy appropriate for intended outcomes, this post is an attempt at providing a framework for variations on project-based learning (PBL) and part of our project-based world campaign. Key Knowledge, Understanding and Success Skills. The project is focused on student learning goals, including standards-based content and skills such as critical thinking/problem solving, collaboration and self-management. Challenging Problem or Question. The project is framed by a meaningful problem to solve or a question to answer, at the appropriate level of challenge. Sustained Inquiry. Students engage in a rigorous, extended process of asking questions, finding resources and applying information. Authenticity. The project features real-world context, tasks and tools, quality standards or impact. Or it speaks to students’ personal concerns, interests and issues in their lives. Student Voice & Choice. Students make some decisions about the project, including how they work and what they create. Reflection. Students and teachers reflect on learning, the effectiveness of their inquiry and project activities, the quality of student work, obstacles and how to overcome them. Critique & Revision. Students give, receive and use feedback to improve their process and products. Public Product. Students make their project work public by explaining, displaying and/or presenting it to people beyond the classroom. Each of these dimensions offers a series of tradeoffs. The continua presented below aren’t a range of bad to good, they are a series of instructional strategies that should be consciously selected for a set of intended outcomes. Projects typically have a set of desired outcomes and defined deliverables; often knowledge, skills as well as dispositions. Desired outcomes are often incorporated into a rubric assessment and clearly communicated up front. Inquiry-based learning focuses on questioning, critical thinking and problem-solving. “The idea behind true inquiry-based learning is to ignite your students’ curiosity, the spark that motivates them and makes them want to learn more,” said Chicago teacher Georgia Mathis. She identifies three or four lines of inquiry explored simultaneously over a five-week period allowing student voice and choice in production of something that demonstrates acquisition of knowledge and understanding. With well-defined lines of inquiry and guidance in research and production, inquiry-based learning is very similar to project-based learning. Applied learning emphasizes hands on experiences. Like Project Lead The Way courses, they may be a series of teacher-led activities or more open-ended projects. Maker education is only bounded by the materials, tools, and creativity of teachers and learners. It’s a design and tinkering experience based on a particular challenge and/or set of resources (see 18 part makerspace series by Lindsey Own). Exploration-based learning includes virtual science environments, virtual reality expeditions, and outdoor learning experiences. Pathways may be limited, directed, adaptive or open-ended. Creative play, such as the Global Cardboard Challenge, lets children explore their interests and passions through open-ended activity but can be relatively specific about desired outcomes including creativity, critical thinking, resourcefulness, perseverance and teamwork. Project topics and deliverables can be defined by a teacher as they are at most New Tech Network schools. Teachers at Katherine Smith Elementary in San Jose ( a New Tech affiliate) use driving questions to scope projects (like the primary geometry project right). Student products may be similar but not identical. Senior projects often share a common deliverable framework but leave the topics wide open. Examples include policy projects at Chavez Schools and Catalyst research projects at Singapore American School. Moving to the right on teacher-versus student-directed continuum increases voice and choice and it increases variability of topics and outcomes and could lead to learning gaps (what some critics call the “swiss cheese” problem). A project can be narrowly defined or covering multiple subjects. Schools in the New Tech and High Tech High networks help students frame projects that integrate typical (e.g., social studies and English) and surprising (e.g., math and art) subjects. Students in Harmony’s Learner-Centered STEM model are required to complete long-term interdisciplinary projects that connect STEM to the Humanities. The 9th grade STEM class at El Paso High (right) combines software design, physics, math and a little carpentry (and is in Spanish one week, English the next). Most real world problems are multidisciplinary in nature but supporting them in school requires collaboration across departments and schedules. In addition to content knowledge, even narrowly defined project typically teach research, self- management, communication and often collaboration skills. Problem-based learning is usually confined to a subject (like math) and includes short tasks or lines of inquiry. The product or proposed solution may be expressed in writing or a presentation. Projects typically require more steps including independent inquiry and require creation of a complex product for presentation to a public audience. (See John Larmer’s discussion of Project Based Learning vs. Problem Based Learning vs. XBL). Projects can be assigned to individuals, pairs or teams. Team projects teach important lessons about collaboration but can give rise to a free rider problem where some team members don’t make an equal contribution. A common solution is identifying and assessing individual contributions to the team effort. In business, a project manager is responsible for timeline, staffing, resources, budget and deliverables. She may have to negotiate all of these with an executive sponsor. In schools, timelines and budgets may be smaller and teachers are likely to control approach (individual or team), but there’s still the question of who manages time and deliverables. However checking in can turn into management, where a teacher is directing each step. The key to building student agency and project management skills is requiring student project managers to make adjustments in their approach, schedule and work product. If a teacher manages every step of the way it may lead to better deliverables, but students lose the opportunity to learn valuable project management lessons. Even well-known “wall-to-wall” project-based schools like Bulldog Tech in San Jose use a variety of strategies. For example, Bulldog math teachers use problem-based learning: short activities that don’t result in a public product. 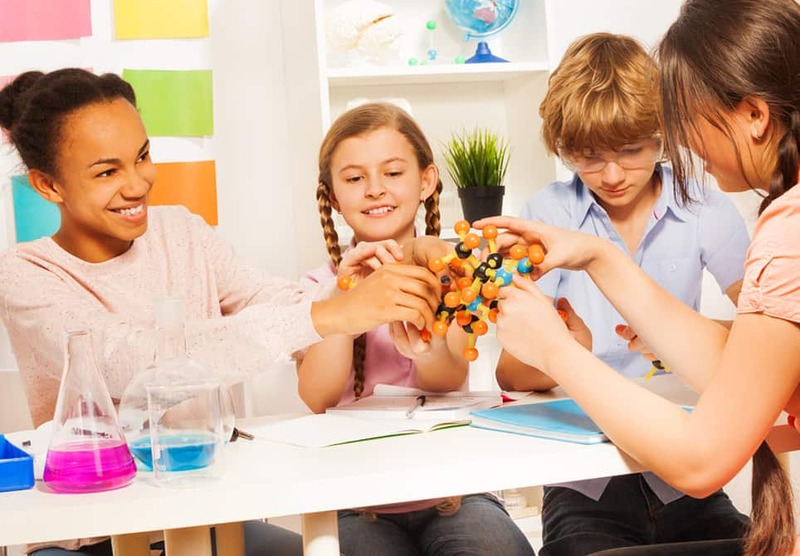 In addition to personalization strategies in a blended environment, projects are often combined with both more prescriptive strategies such as whole group instruction and lab experiments as well other inquiry-based strategies including Socratic Seminars and literature discussions. Project-based learning is a high engagement strategy that can lead to powerful learning outcomes, if well designed and combined with supports that ensure that all students are prepared to benefit and enjoy the rewards of a quality public product. I might add a variable about “innovation” or applicability… From understanding/analyzing to applying/problem-solving. This is a variable that definitely shows up in maker/tinkering learning experiences. Are students building to better understand what exists, or are they building to create something new? Like the other variables you’ve identified, neither is intrinsically better than the other in every situation, but that difference is definitely something I try to be aware of as we develop new learning experiences for our makerspace. Great synthesis of these different teaching/learning strategies into a means of comparing them along different scales, rather than just categorizing by their “brand names” ! What’s also interesting to note is the scoring of projects. Is it an overall average? Are there “points” and are they truly balanced in weight? Do they need to be? I think where the conversation of Project Based Learning gets really juicy is when we think about what is selected in terms of content, to what level, how it will be scored and to what degree do the students play or lead? Thank you for sharing the differences. This topic is too often only topically covered in professional learning conversations and articles.